Online businesses are often a bit wary of reviews. What if a disgruntled customer ruins your reputation by posting a long angry review all over your lovely product page, which has been designed with conversion in mind? But you should never shy away from soliciting the opinions of your customers and discovering what they really think. This isn’t just because it can let you improve your product or service. It is also an incredibly powerful tool for boosting your bottom line, as reviews make a huge impact on your conversion rate. Online retail reviews and ratings service YOTPO collected data on 65 million ecommerce orders across 120,000 stores, representing two billion dollars in transactions. 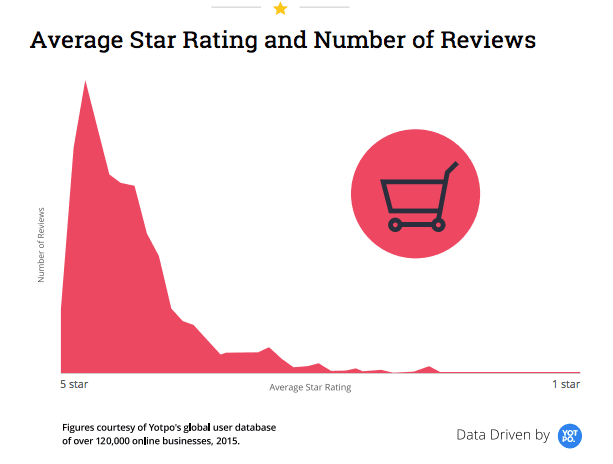 This data has revealed just how critical customer reviews are to increasing ecommerce sales. One of the simplest types of review, which is particularly prevalent on ecommerce sites that collate content from multiple sellers (e.g. Amazon), is the 5-star rating. The instant familiarity of this simple system means your customers can see at a glance what others think of your product. 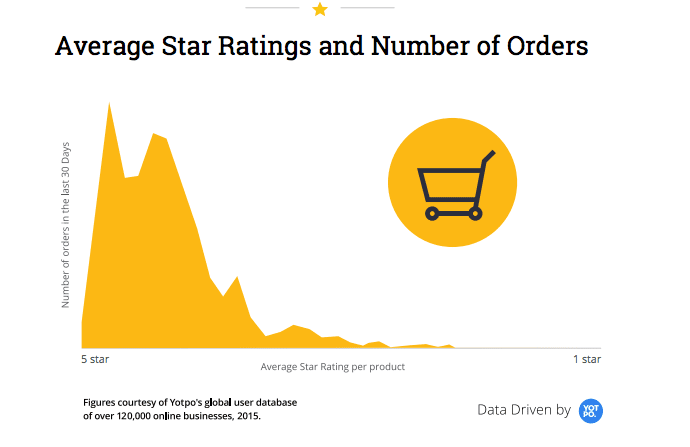 This chart shows how the number of orders at a product level decreases as star ratings decrease. As would be expected, more stars mean more orders. Nothing surprising there, but it is interesting that the number of orders drop massively at exactly 5 stars. It's far better to have a 4.8-star rating. This seems counter intuitive, but its probably because if a business has an exactly 5-star rating (rather than 4.9) it means very few people have reviewed them. What is more, these few people are quite possibly to be members of the companies’ staff giving a 5-star rating to try and boost sales. Customers are much more likely to trust a 4.7-star rating which suggests it is the average of a large number of reviews than a rating of exactly 5 stars which suggest not a huge amount of people have reviewed (because realistically in a large number of reviews at least some must have given less than 5 stars). It is also interesting how quickly the number of orders drop off when you get below 4 stars. Products with 3-star ratings get less than one tenth of the orders of those with 4. And once you get down to two stars you see hardly any orders at all. Pay attention to that all-important star rating and do your best to keep it above 4 stars. Try to address any customer complaints and resolve them in a positive way to keep your crucial star rating high. The more reviews, the higher the rating! Always do your best to encourage reviews from your customers. Never let being wary about asking for feedback. 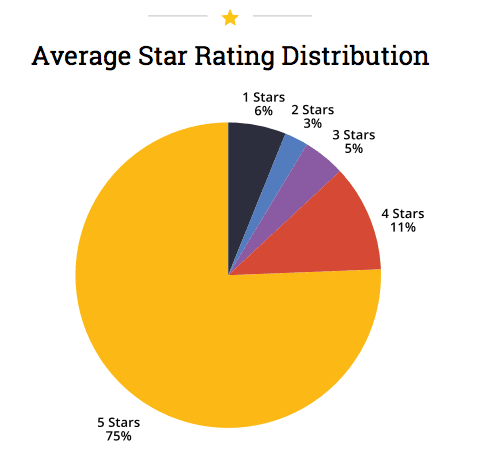 On average the more reviews you get, the more are likely to be 5-star reviews. Companies that got the most ratings also tended to be the highest rated. The vast majority of reviews are positive, which is another reason why you shouldn’t be worried about asking for reviews. A whopping 75% of reviews across the 120,000-ecommerce sites YOTPO examined were 5 stars, and 4 stars got almost as big a percentage as 1, 2 and 3 stars. Only 9% of reviews were 1 or two stars. How do reviews impact Social commerce? Reviews are inherently social. They are the opinions of your customers after all. So it shouldn’t be a surprise that social and reviews work very well in tandem. 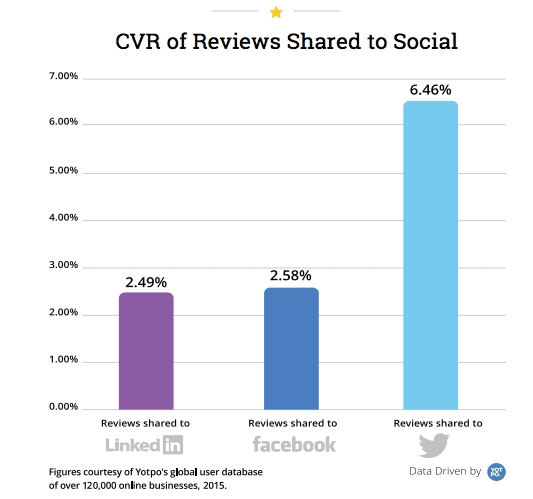 The data shows that businesses which share reviews to social have higher conversion rates than those that don’t. In fact, when reviews are shared to Twitter the conversion rate is 8.4 times higher, and where they’re shared to LinkedIn they are 5.3 times higher. So make sure to share those all important reviews, or you could be missing out on a huge boost in revenue. If you would like more insights into the effects of reviews on social commerce, see the full report from YOTPO.